Many Sides To This Story? A few days ago, rather than drive 10 miles to hike 4 miles, I decided just to walk the 2 miles into town. As I crossed the bridge over a stream that I pass nearly every day, I relished that this time I could actually stop, take my time, and look down into the stream… I did a double-take! Amidst the sepia monochrome of rocks, silt, branches, and fallen leaves… Well, see for yourself! 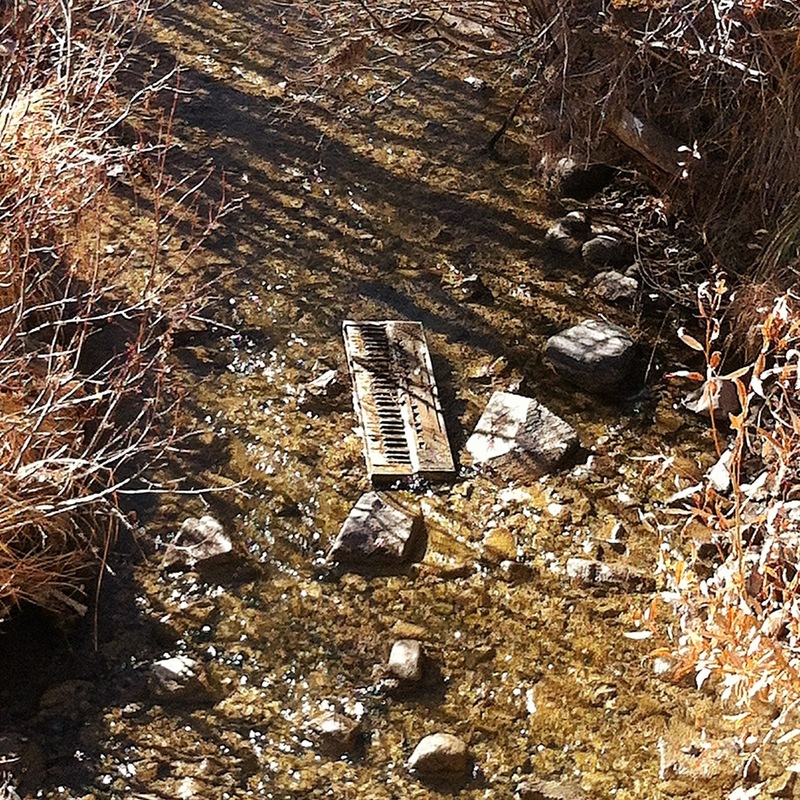 I stood there for a moment, rather awed to ponder how a keyboard (and a well-muddied one) could end up in a stream bed. It seems to have camouflaged itself, as if to hide its secrets. Now, as I write, it occurs to me that this keyboard symbolizes several themes converging in my life lately. Sometimes all we can do is marvel and appreciate, when the reasoning escapes us. Here’s wishing you a day that lifts your spirits, totally beyond reason! For some reason a keyboard in a stream is perhaps the most random thing I have evere seen. Artistic temperament getting the better of the keyboardist perhaps? No doubt! Or perhaps someone had simply had enough! when i first glimpsed the pic i thought it was a few houserooves in a much bigger river taken from further away. best place for a keyboard if you ask me. Ur Photo would make an Interesting CD cover for a Rock & Roll(ing) Band…lol! Great idea, Babajij! I wonder what the album title would be? Someone attempting to get a handle on Handel? Great post-made me smile and think. Thanks, Elena! Wouldn’t you love to know just one of the stories! Have a great day, dear! short on reasoning, long on laughter! Hi, Janet, thanks so much for stopping by! Yes, that’s sort of been a goal of mine lately, and you spotted it well… (should I be embarrassed?) I hope you and the family are doing well! Lots of love to you!